Every year, at about this time, I start to get questions about healthy beach snacks. I live on the East Coast, and beaches and summer, well, they go together. For years, we’ve trekked to the beach for our annual vacation. Mornings filled with coffee, sunscreen and packing lunch and snacks are the norm. If you’ve been reading along over the years, you know that I loosen up the food routine quite a bit on vacation. You’ll find white bread, Cocoa Puffs, potato chips, and Oreos in my vacation kitchen, along with fresh produce from the local farm stand and fish from the fishmonger. On the beach, kids are in “go” mode. They’re active and the sun can be draining and dehydrating. The point of a healthy beach snack is to keep kids filled up while providing them with the energy they need to swim, run, and build in the sand. There is nothing worse at the beach than a hot, sweaty, whiny, and hungry child. And, standing in line at a blazing hot concession stand waiting for fried food or sugary snacks can’t be the go to plan each time you head to the shores. What is a Healthy Beach Snack? When planning and packing beach snacks, I’d like you to think of foods that are pre-packaged or easy to wrap up, and can be eaten with some fresh fruit to make a well-balanced, hearty snack that could almost be a mini meal. Whenever possible, seek out foods that have some protein in them to avoid the high sugar melt downs associated with fruits snacks, cookies, or candy. In a pinch, you can always pack a good source of protein, such as sliced deli turkey or pre-packed nuts, to go along with a snack that might be less filling and a bit higher in sugar. 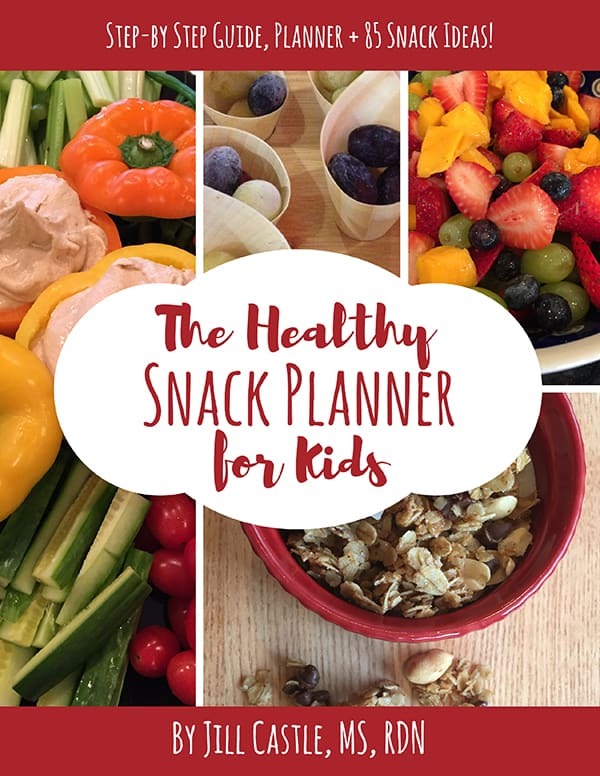 If you’re at a loss for how to compose a healthy snack, you can check out the resource below. It cover the ideal composition of snacks to cover hunger, how to offer them, where to serve them, and why kids may need them. Healthy beach snacks ensure a fun-filled and tummy-filled day in the sun. Be sure to pack everything in a cold cooler to avoid food spoiling or melting – and don’t forget your frozen water bottles! Freezing water bottles overnight make for a great cold drink in the hot sun and also help keep foods cold in the cooler. Don’t forget to save room for an ice cream cone on the way home! Need more snack ideas? I’ve got more for you here!